Da Bears Blog | What RBs in the Draft Fit the Physical Profile for Chicago’s Offense? What RBs in the Draft Fit the Physical Profile for Chicago’s Offense? Short: Reid RBs are routinely at or below league average of 5’10”. Well-Built: Reid RBs at or above league average 214 pounds. Good Acceleration: Reid RBs at or below average first 10 yards of the 40-yard dash of 1.59 seconds. 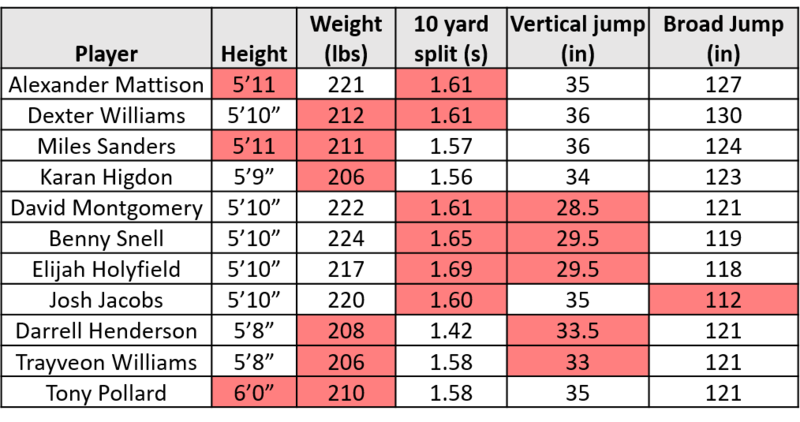 Explosive: Reid RBs at or above average vertical jump of 35″ and average broad jump of 118″. Every RB Reid has brought to Kansas City hit at least four of these five thresholds. With that profile in mind, let’s look at the running backs in the 2019 draft and see who might fit the physical profile for this offense. No RBs hit all five thresholds at the Combine, but six players went 4-for-5. They are shown below, with the threshold they missed highlighted in red. It’s really important to note that best physical fit does not mean best player. Think of it more as a chance to identify players who the Bears are likely interested in, and then do some film study of them. Alex Barnes is probably the best physical fit for this offense in the draft in that he’s just a little tall, but otherwise matches every single box in terms of bulk and athleticism. 11 RBs at the Combine went 3-for-5. They are shown below, with thresholds they missed highlighted in red. Miles Sanders jumps out to me as a fit from this list. He was 1/8″ from being rounded down to 5’10”, and is only 3 pounds short of hitting that threshold. So physically, he’s not far off from the mark, and he checks all the athletic boxes. Again we see a number of guys who are light. I’m not sure how much weight (pun intended) to put into that metric, since the study didn’t include lighter backs like Charles and LeSean McCoy who excelled under Reid but were not brought in by him to KC, so didn’t apply to my study. If you exclude weight, many of the guys on here are excellent physical fits. One player from this group who has been particularly linked to the Bears is Trayveon Williams, who seems like a decent fit to me. He’s a little light, but otherwise fits the bill as a short and decently quick/explosive player. Six RBs at the Combine went 2-for-5. They are shown below, with thresholds they missed highlighted in red. These players are probably not great physical fits for Chicago’s offense, though the Bears have been linked to Weber and Armstead out of this group. We see a few guys who had to skip drills (DNP = did not participate) crop up here. That could change their results once pro day numbers are out. Four RBs at the Combine went 1-for-5. They are shown below, with thresholds they missed highlighted in red. This is mostly a list of players who did not work out at the Combine due to injury, so the thresholds don’t mean much here. Anderson in particular strikes me as somebody who could be interesting in Chicago’s offense, though his injury history is a concern. Run well between the tackles. Davis does, Cohen doesn’t. Be a weapon down the field in the passing game. Cohen is, Davis isn’t. Produce explosive plays. Cohen does, Davis doesn’t. These are traits that stats won’t really reveal (though college stats on explosive run % can help), so film study is definitely needed. Based on the physical profiles established here, guys I am most interested in studying include Miles Sanders, Travis Homer, Trayveon Williams, Karan Higdon, Darrell Henderson, Myles Gaskin, Alex Barnes, and Justice Hill. All of these players fit the physical profile of a lead RB for this offense, meaning it’s time to scout out how well their skill sets match what would be asked of them in Chicago.